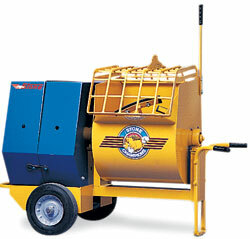 Mortar Mixer Rental – Stone 465PM Mortar Mixer, is available for rent from the Duke Company in Rochester NY, Ithaca NY and the entire Western New York region. Capacity of 4 cubic feet (equates to 3/4 – 1 bag) capacity. 12″ diameter. High speed tires, tow bar and safety chain for portability.